Precious metals have been a popular investment for retirement plans since the financial market collapse in 2008. Most standard IRAs with financial institution custodians will typically only offer precious metals through funds or other complex structures whereby the IRA does not directly own the precious metals. 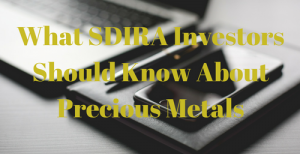 A self-directed IRA can hold actual precious metals as long as those metals are not considered collectibles under the law and as long as they are properly stored. The Wall Street Journal recently reported on the radio advertising that promotes an ability to store gold owned by a self-directed IRA at the IRA owner’s own home. Based on the Journal’s reporting and investigation, the IRS issued a statement warning against such storage. 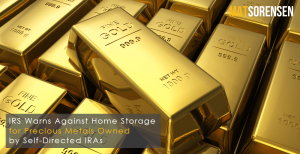 I’ve written about this topic on a number of occasions and our firm has always recommended against home storage for precious metals owned your IRA or your IRA/LLC.